Ethan Hawke, Uma Thurman, Jude Law, Loren Dean, Alan Arkin, Gore Vidal, Ernest Borgnine, Blair Underwood, Xander Berkeley, Tony Shalhoub, Jayne Brook, Elias Koteas. 106 minutes. 'I only lent you my body. You lent me your dream.' Jerome (Jude Law) to Vincent (Ethan Hawke) in GATTACA. 'I never saved anything for the swim back.' Vincent (Ethan Hawke) reveals to his brother Anton (Loren Dean) the extent of his drive in life in GATTACA. The work of Kiwi filmmaker Andrew Niccol exhibits an interest in exploring the moral and ethical issues raised by advances in technology: reality TV in THE TRUMAN SHOW (2008, screenplay only), computer generated actors in SIMONE (2002) and the ability to stop ageing in his most recent picture, IN TIME (2011). He's an intelligent, thought-provoking auteur who has made far too few films (he also supplied the story for 2004's THE TERMINAL and wrote/ directed the gunrunning drama LORD OF WAR, 2005). 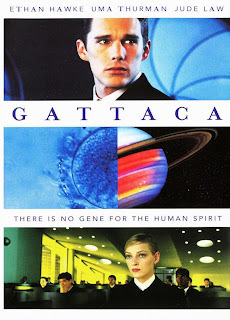 GATTACA was his writing/ directing debut, and despite flopping upon release, has garnered a cult reputation as one of the best modern sci-fi films. GATTACA opens with two quotes. The first is from Ecclesiastes, 7:13 - 'Consider God's handiwork. Who can straighten what he hath made crooked?'. The second is from American psychiatrist and bioethicist Willard Gaylin - 'I not only think that we will tamper with Mother Nature, I think Mother wants us to'. Niccol is preparing the viewer for a science fiction film that although superficially a genre film, a chase film and a love story, is really a meditation on what it means to be human and the moral and ethical questions created by bioengineering. Ethan Hawke is Vincent Freeman, whom through effective narration and flashbacks, we learn is not all he seems. He is a flight navigator at Gattaca, but he has gained his position surreptitiously. In the 'not-too-distant future', parents can choose at birth to tamper with their child's DNA in order to make them as perfect as possible. ('The best of you.') It's a process called 'liberal eugenics', and determines the social order. Those who are born using the process are instantly placed in the upper classes of society and are regarded as 'valids'. Those who aren't, are regarded as 'invalids' (or a 'faith birth', a 'God-child' or a 'de-gene-rate') and discriminated against in society (replacing race, gender, sexuality and education as the primary reasons for discrimination). Vincent was born without the use of 'liberal eugenics' (despite his parents having the choice) and as a result finds himself on the bottom rung of the social ladder due to his myopia and the 90% probably of him developing a weak heart and dying around the age of thirty. Niccol creates a unique and fascinating world with his premise, and like BLADE RUNNER (1982), surely an influence, he has characters stranded on Earth desperately hoping for their chance to escape and live or work in the heavens. Both worlds have a clearly defined social class system (those with money have the chance for a better life for them and their offspring in BLADE RUNNER, those with money have the chance for a better life for their offspring if they choose the 'liberal eugenics' option in GATTACA). Both films also have a minimalist look and feel to the worlds created. We are meant to feel something by spending time in the worlds of both films, rather than sit back in awe. The huddled, rain sodden streets in BLADE RUNNER remind us that Earth is now a home for the stranded and undesirable. GATTACA's world of sharp, yellow sunlight, vertical space, and angular buildings is cold and oppressive, the yellow rays of the sun reminding us that these people live on Earth but are are in the shadow of a sun whose metaphorical representation as the 'heavens' is the only thing sustaining their spirit. Vincent has gained his position by asuming the identity of a 'valid', Jerome Eugene Morrow (Jude Law), an-ex-swimming medallist who is now paralysed from the waist down because of a car accident. Every day, Vincent wears contact lenses and fake fingertips (with Jerome's skin, DNA and blood embedded in them), carries samples of Jerome's blood and urine in case of a sudden ID check (Vincent's interview for Gattaca consisted of a piss test) and scrubs off his dead skin and clears away any stray hairs in the shower. He also endured painful pins in his legs to tkae him to Jerome's taller height. Vincent has achieved his dream of becoming a flight navigator: in one week's time he will leave for a manned mission to Titan (the 14th moon of Saturn), based on his flight plan. 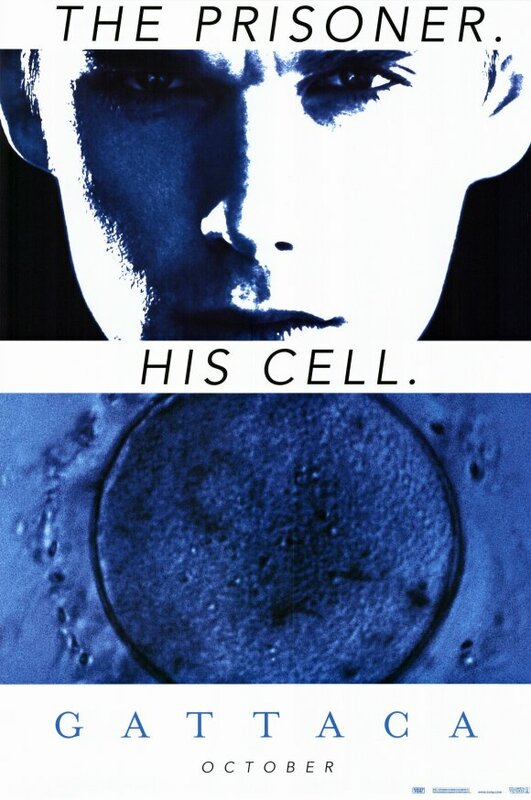 All is right in his world until the murder of one of Gattaca's managing directors. A stray hair of Vincent's, found near the body, leads the police to believe him to be a suspect. But they are looking for Vincent and not Jerome. As long as he can keep his real identity a secret, his future is safe. 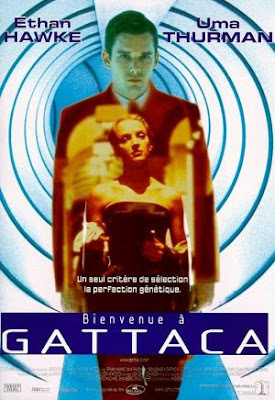 It becomes quickly clear that although GATTACA has a ticking clock scenario, a murder mystery (which is resolved in an offhand way, and neither we or the film cared about the outcome anyway), a burgeoning romance between Hawke and Uma Thurman and a sci-fi setting, the provocative issues raised are the real heart of the film. When does it become ethically questionable to have 'a helping hand' from science in order to have a better career or life? Vincent's potentially weak heart and myopia DO make him a poor choice for a flight navigator. Medical science could help that. As the opening quotes ponder, is it unGodly or Godly to tamper with nature? Niccol would probably argue that it is our strengths and weaknesses that make us human. Certainly Vincent is proof of the power of the human heart and human willpower. He manages to rise so high because he wants it so much and is willing to suffer and endure whatever he has to do to succeed. (He never saves 'anything for the swim back.') Vincent makes a very interesting contrast to Jerome. Jerome was born with perfect DNA which enabled him to become one of the elite. But he gave up on life once he had a major setback. Vincent was BORN with a major setback, and will never give up. All the characters in the movie (apart from the embittered and slyly amusing Jude Law and seasoned cop Alan Arkin) are cold, arrogant and unemotional. There is little humanity in Gattaca. Ironically, it takes the most basic of human emotions (rage) to bring things crashing down. GATTACA is a very impressive debut for Niccol, and one that he has unfortunately not yet managed to top or equal (it would have been interesting to see him direct his script for THE TRUMAN SHOW). It's all in the control of his material and in his choices. The cold but beautiful world of Gattaca is complemented by the stately, classical Michael Nyman score. The score complements the beauty of Uma Thurman, who has never looked so ravishing. Thurman, Hawke, Law and Loren Dean (as the head cop) bring youth and energy to what could have become a cerebral, dull, lifeless movie in lesser hands. Thurman doesn't really have much of a role, and is not used to the best of her talents. Hawke is perfect casting as Vincent: his persona gives off the vibe of a very driven, quiet, intelligent man determined to make his path his way. Which is how Hawke's career has panned out. he has mostly managed to make the kinds of films he wants to make. Jude Law has one of his best early roles as Jerome, and bravely plays a disabled, sickly, dark character. His scenes opposite Hawke bring out the best in each other (Law is if anything a generous actor). They make an appealingly odd couple. Law's Oscar for THE TALENTED MR. RIPLEY (1999) was only three years away. Alan Arkin and Ernest Borgnine (in a cameo as Gattaca's head cleaner) also bring humanity and humour to the film. American author Gore Vidal is an interesting choice as Gattaca's flight director, but he fits because the film is like him, literary and political to the bone. If the film has flaws, it would be elements of the ending. Having Loren Dean's cop be Hawke's brother seems very contrived and pat. One could argue that the flashbacks to Vincent beating his 'valid' brother at swimming set it all up, but frankly, the flashbacks work and serve a purpose (they prove that the human spirit can be stronger than genetics and give Vincent the motivation to think he can succeed) without leading to the ending. The romance between Hawke and Thurman is not strictly necessary and feels like a commercial requirement rather than a plot one. But it doesn't mar the film, and Vincent's victory needs a character to whom his wisdom can be passed on to. Thurman's Irene is (like Vincent) suffering from a heart problem that means she will never make it off the planet. If Vincent can do it, she can. Xander Berkeley's doctor knowing all along that Vincent was an 'invalid' and protecting him at the end is unexpectedly sweet. 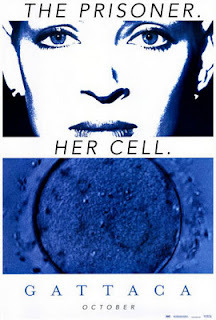 The heart of Gattaca is cold, but the heart of the film isn't, so it's appropriate. Jerome's suicide is poignant. Vincent has been told he is not going to live long but fights to realise his dreams. His courage gives Jerome the courage to accept that he doesn't want to live. In the world he lives, not being perfect makes for a useless life. He will like Vincent transcend to the heavens, but he will do so with his life. His injury has permanently damaged his psyche and spirit, whereas Vincent is capable of transcending his inherently damaged body via his psyche and spirit. As with THE TRUMAN SHOW, GATTACA has a beautifully poignant, bittersweet and ambiguous ending (will Vincent be able to evade detection forever?). GATTACA is a beautifully constructed, intelligent slice of science fiction whose ideas and questions linger long after the credits roll. Films such as MINORITY REPORT (2002) and THE ADJUSTMENT BUREAU (2011) would seem to owe a debt to a fellow SF/ Noir/ chase film of ideas and of heart. It's also a film that seems prescient, for it's ethical questions are still being asked in the scientific community to this day. The film has lasted because it's a film of quality, because it's not a spectacle or a blockbuster, and because it's a film which takes it's time to tell a story and create a convincing alternate world not too dissimilar to our own in many respects. It's an essential movie. NB. Hawke and Thurman fell in love on set and were married from 1998 to 2004, having two children. They also collaborated on TAPE (2001) and CHELSEA WALLS (2001, Thurman acted; Hawke directed). Hawke would later star in Niccol's LORD OF WAR (2005). GATTACA was produced by Danny de Vito's Jersey Films. The title of the film is composed of the letters utilised to label the nucleotide bases of DNA: Guanine, Adenine, Thymine and Cytosine. Jerome's stairs have a DNA-like helical structure. The movie was filmed as 'The Eighth Day', but a Belgian film with the same title had already been released (in 1996) by the time the movie completed shooting. The name of the facility where Vincent and Irene work supplied the final title. AVAILABILITY: GATTACA is available on DVD (Region 1 and 2) and Bluray (Region A and B) in a Special Edition featuring a retrospective documentary, a vintage featurette, a doco on genetic research and a deleted scene and outtake. RECOMMENDED VIEWING: THE TRUMAN SHOW (1998), IN TIME (2011), LOGAN'S RUN (1976), MINORITY REPORT (2002) and THE ADJUSTMENT BUREAU (2011). 'Gattaca': IMDB entry. Read it here. 'Gattaca': Wikipedia entry. Read it here. Paul Rowlands is a Japan-based writer. After completing a BA Humanities course (majoring in English and Science) at the University of Chester, he moved to Japan in 1999. Paul writes for the James Bond magazine, Kiss Kiss Bang Bang, and has had an almost lifelong obsession with cinema, something the advent of DVD only increased. An aspiring novelist, short story writer and screenwriter, he has until now mainly written about film for his own pleasure, various blogs and for so far unpublished projects. Paul is also preparing his own short film, and has at least three writing projects in various states of completion.